Never before have you seen such a huge hammer in a skill game. You will have to put it to good use though as there are lots of magical creatures that are threatening your castle. Standing on top of it, you will be able to throw hammers at the ghosts and knock them back a couple of feet. When they are in the range of your hammer you should swing it from left to right and smash the enemies with it. 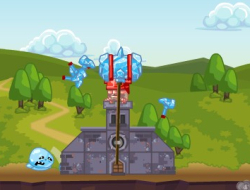 Collect the coins left on the ground by hovering your mouse over them and then buy upgrades to make sure your castle will survive. Use the mouse to swing them hammer and click to throw objects. Magic Smash Hammer 0.00 between 0 and 10 based on 0 votes.